The River Road neighborhood and surrounding areas of Eugene are growing in population, and traffic and development are having an impact. How can we guide and absorb growth in more positive ways? What land use and transportation improvements do YOU want for the neighborhood? Protect the natural areas along the Willamette River? Restore and enhance connections between the River and Road? Accommodate growth and preserve the UGB, while protecting established residential areas from incompatible infill? Retain and improve our quality of life? Reduce our neighborhood's contribution to global warming? The Lower River Road Nodal Overlay? The Rasor MUC Study Area? River Road and Whiteaker Neighborhood Boundaries? New Roads on the Greenway? 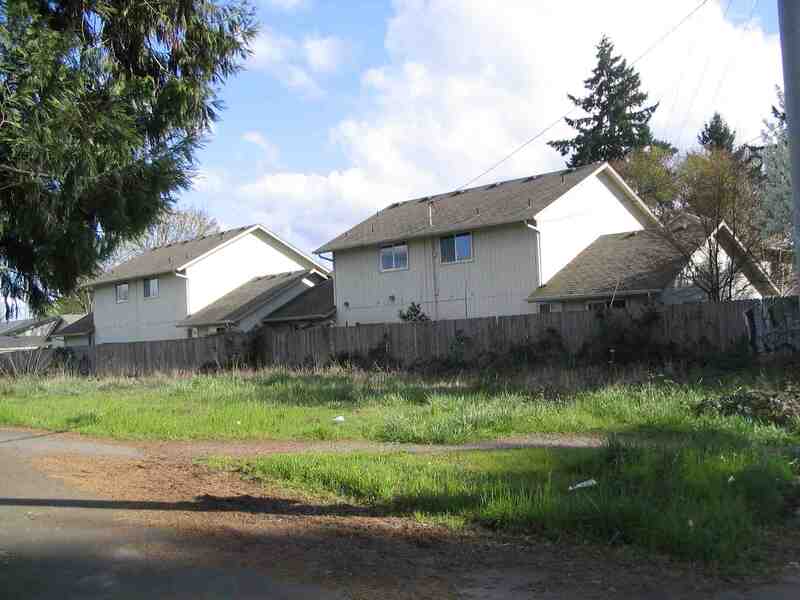 The Lane County HACSA (housing agency) Property? Current Zoning and Development Codes? What Does Density Look Like? Public and Private Ownership of Land? A Grocery or Cafe/Bakery for Lower River Road? Will Residents or Businesses be Forced to Sell? Will Rasor Park or Natural Areas be Developed? Effects of Ballot Measure 37? Create a more pedestrian-friendly neighborhood? Improve our neighborhood gateway and identity? Direct growth in a way that revitalizes and renews commercial areas and brings basic neighborhood services? Create a healthy, distinctive, and sustainable neighborhood that is a real community? River Road board members and residents working with UO Prof. Mark Gillem to consider planning options. Join us for third Monday meetings! 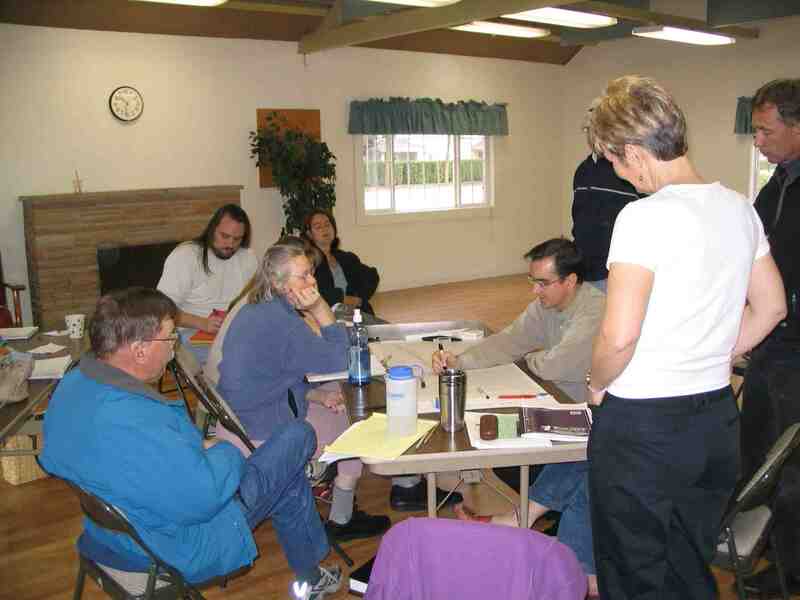 The River Road Community Organization is the Lane County-chartered, City-recognized neighborhood association for the River Road neighborhood. Membership is open to all residents and business and property owners of River Road. Current board co-chairs are Steve Norris and Jolene Siemsen. Other board members are: Rob Handy, Kate Kelly, Marilyn Mohr, Eileen Nittler, Carleen Reilly, Becky Riley, and Jan Spencer. To learn more about our organization and neighborhood boundaries, visit the RRCO page on the City of Eugene's Neighborhoods web site (Home > Planning and Development > Neighborhoods). RRCO generally meets on the third Monday of each month at 7 pm at the River Road Park District Annex facility (1055 River Road). All meetings are open to the public. However, time and location sometimes vary. Meeting notices are published in the Register Guard. To get on the email list for notification about meetings, call or email Steve Norris, 461-0953, snlnorris@msn.com. RRCO continues to sponsor frequent discussions and speakers on neighborhood planning issues, including the Rasor Mixed-Use Center planning project. Eugene's population has grown at a rate of nearly 2% (about 2,000 new residents) per year in recent years. The population of the River Road area has increased at a rate of about 1% per year, and this trend is expected to continue. The population of the Southern Willamette Valley is expected to grow by more than 150,000 in the next 50 years. Eugene residents have told City leaders that they want to accommodate population growth by holding the Urban Growth Boundary (UGB) and encouraging infill and mixed-use redevelopment of under-used land near the City center. The City Council has adopted Growth Management Policies that support this intent. Transplan, the regional transportation plan, also calls for transportation-efficient land use planning with the goal of reducing vehicle miles traveled and increasing use of alternative modes of transport, such as transit, biking, and walking. A key strategy adopted by Eugene is to promote "mixed-use centers". Part of our lower River Road neighborhood--and a small corner of the Whiteaker neighborhood--has been identified as an area with good potential for redevelopment into a higher density mixed-use center. Now, the City Council--with the support of our neighborhood organization--has directed staff to make this area a priority for planning attention. 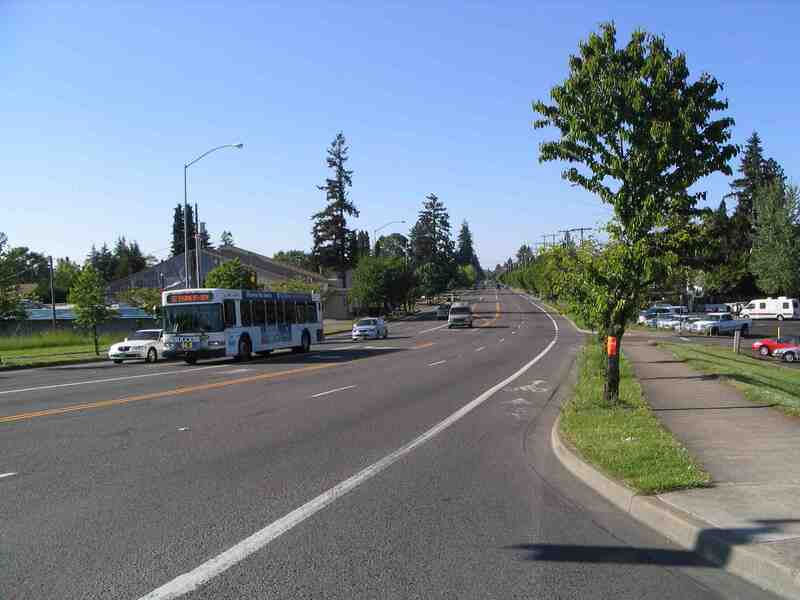 City planners have secured a grant from the Oregon Department of Transportation (ODOT) to work with area residents and property owners to do more detailed land use and transportation planning for this area. The study area is shown within the red line on the map to the right. Goals of the planning are to promote a more pedestrian-friendly, livable neighborhood, and to reduce vehicle travel in the regional transportation system. Planning will explore how patterns of development—especially higher density and mixed residential and commercial uses--as well as changes to roads and walkways, bike paths, and transit can help reach these goals. 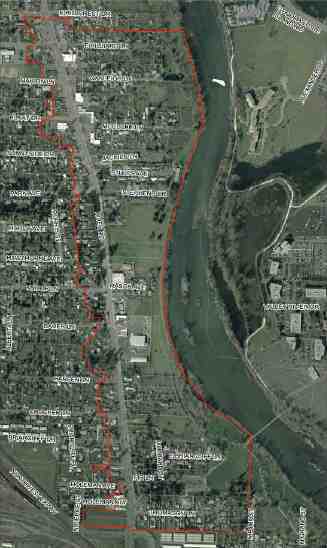 The Study Area extends along River Road from near Thomason to past Hilliard, and east to the Willamette River. Map prepared by Spencer and Kupper, for Oregon Department of Transportation, Transportation and Growth Management program. Note: The City named this planning area after Rasor Park because of the 10-acre park's central location within the area's boundaries. 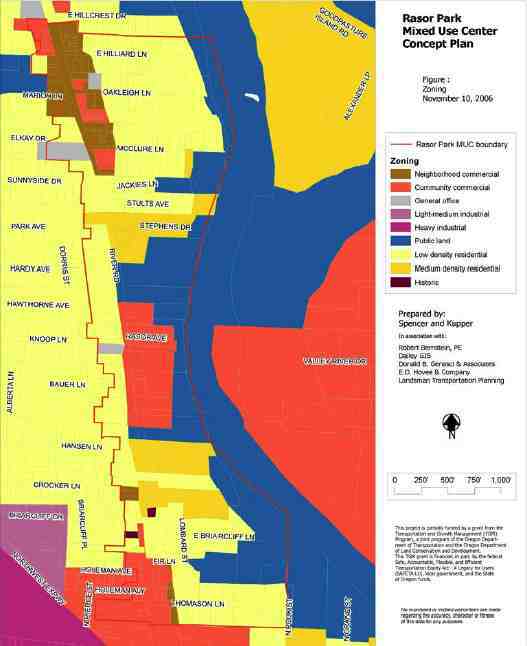 However, this does not mean Rasor Park itself is slated for high density development. Public parks and open space are valuable components of successful mixed-use and higher density urban centers. The City does expect to implement the Rasor Park Master Plan--which calls for adding a parking lot along the River Road edge, and a paved path through the park. To be sure, any park can be sold or swapped and developed if there is enough community demand--yet this would require City Council action and it would represent a major change in community sentiment if residents were to ask for Rasor Park to be sold or swapped. It is possible that the public might support a plan that proposed small boundary adjustments to public park land in this area to improve the shape, edges, or pedestrian access. The public might also support changes to implementation of the Rasor Park Master Plan itself, to allow the park to better integrate with a plan for a larger mixed-use center. Beyond this, it seems very unlikely that Rasor or other park lands in the Greenway would be sold or developed. Mixed-use development refers to the practice of containing more than one type of use--usually some combination of residential, commercial/retail, or office--in a building or set of buildings. The mixed-use development concept is at the heart of Eugene's transportation and growth management strategies. Eugene and many other cities now recognize the problems caused by the single-use zoning in place in many U.S. communities since World War II. This zoning intended to separate "incompatible uses" such as polluting factories from residential neighborhoods. However, at the same time, it separated residents from their workplaces and the daily services they needed. In this way, it encouraged urban sprawl and auto-dependency. Thanks in large part to single-use zoning, the U.S landscape is now dominated by strip malls and enclaves of auto-oriented civic and commercial buildings. Sprawling suburbs and subdivisions without much individuality or character have developed in place of traditional neighborhoods, and automobile use per capita has soared. Mixed-use zoning attempts to address these problems. The goal is to encourage new development and re-development to follow patterns more like our older and more compact neighborhoods, creating "downtowns" or "centers" or "Main Streets" for each neighborhood in a community. Mixed-use guidelines intend to encourage developers to build multi-story buildings with residential units above commercial and retail space on the ground floor, and aim to create attractive, pedestrian-oriented streetscapes. Mixed-use development has benefits for both businesses and residents. Businesses owners can live above their businesses if they choose and have customers living in the same or nearby buildings, while residents have commercial services within easy walking distance. What is a Mixed-Use Center or Corridor? Mixed-use centers or corridors are concentrated, multi-acre areas of mixed-use and higher density residential development. They are intended to be large enough to provide a variety of services, activities, housing, and public spaces that collectively form a "downtown" or "Main Street" for a neighborhood. They are also sometimes called "urban villages". They are intended to be attractive and livable neighborhoods with lively pedestrian zones, where it is easy for nearby residents to walk, bike, or use public transit. Eugene, Portland, and many other U.S. cities are mapping out networks of potential new centers. If properly planned and developed, these centers will mature into quality neighborhoods with higher densities--Eugene's MUC program aims to achieve a housing density of at least 12 units per acre--more transportation options, a pleasant walking environment, and convenient shopping, services, and amenities. When combined with improved transit, centers are intended to reduce reliance on automobile travel, slow sprawl onto nearby agricultural and forest lands, and provide a greater variety of housing types inside the Urban Growth Boundary. It is important to recognize that a given neighborhood can support only a limited amount of retail. To create functional, walkable neighborhoods, this retail needs to be concentrated at key locations within walking distance of a significant population, rather than allowed to spread evenly along a low-density corridor. Higher density housing is important in and near retail centers. It is also appropriate along the (formerly low-density) arterial corridors between neighborhood centers. Visit the City of Eugene's Mixed Use Development web site to learn more about Eugene's program to promote mixed-use development. Some land in the Rasor MUC study area is publicly owned or controlled—the River Road right-of-way, greenway parks, and individual parcels owned by Lane County, EWEB, or the City. Public lands are depicted in blue in the map below. The rest of the land is privately owned, though property owners must follow public zoning and land use codes when developing or re-developing their properties. What Development Might Occur Without Planning? Since most of the land in our neighborhood is privately owned, most of the development or re-development that occurs will be driven by the choices made by private landowners and developers, guided by market demand and lender requirements, but limited by existing zoning and land use regulations. Under existing base zoning and land use regulations, our neighborhood will eventually be built up to a significantly higher density than at present. In C-2 (Community Commercial--red on the map) areas, buildings can be up to 120 feet (10 stories), and uses are allowed that serve a broader area than just the immediate neighborhood. 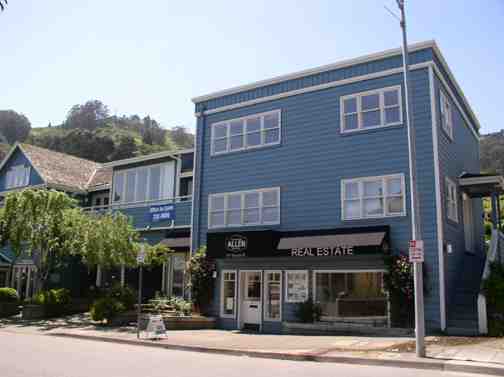 In C-1 (Neighborhood Commercial--brown on the map at right), buildings are allowed to be up to 35 feet (3 stories). In R-1 (Low Density Residential--light yellow on the map at right) areas, lots can be as small as 1600 sq. ft. feet (for a rowhouse), and rowhouse buildings are allowed to cover 75% of the lot, and be up to 30 feet (3 stories). Up to 14 units per acre are allowed. In R-2 (Medium Density Residential--darker yellow on the map), 10-28 units per acre are allowed, and building heights of 35 feet. The Nodal Development Overlay that is in place for part of the Study Area puts additional requirements on development within its boundaries. For new development in residential zones, the overlay increases the minimum number of residential units per acre in R-1 zones to 8 units per acre (there is no minimum otherwise), and to 15 units per acre in R-2 zones (from 10 without the overlay). Is New Development or Redevelopment Imminent? 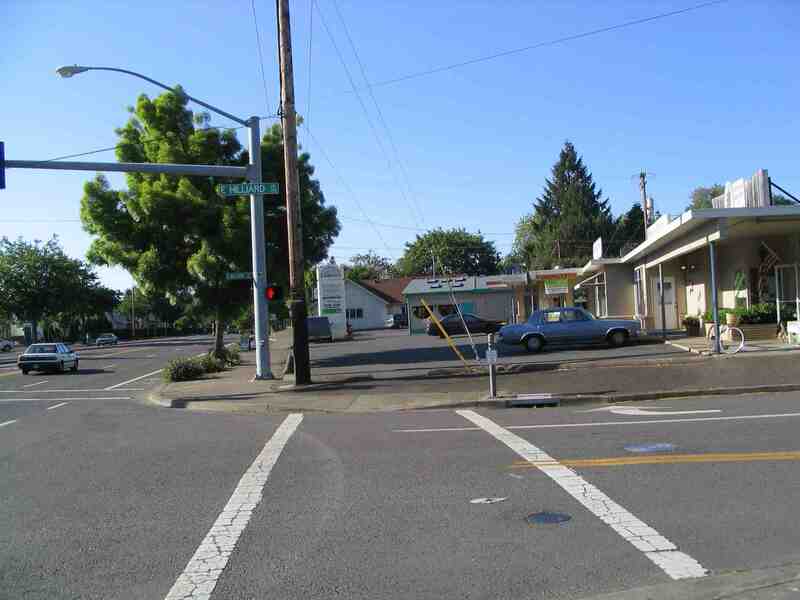 Development is occurring rapidly in many areas of Eugene, including River Road and Santa Clara. New higher density housing has been built throughout River Road in recent years, especially duplexes on R-2 lots, and detached single family homes on minimum-sized R-1 lots. Any property owners may choose to develop or redevelop at any time. Lane County Housing and Community Services Agency (HACSA) plans to develop affordable housing on the R-2 zoned parcel across River Road from Crocker Lane (darker yellow on the map above). This 4-acre property is within the Nodal Development Overlay Zone, and thus current zoning and regulations would require a minimum density of 15 units per acre (or 60 units total). Development of this property may begin within three to five years. It is likely that a new street segment from Lombard would be built to provide access to this property at the time it is developed. Owners of two adjacent R-2 zoned parcels across River Road from Hansen Lane want to create an EcoVillage on their property, with higher density co-housing (minimum allowable density = 15 units per acre), common buildings, and gardens. For more information about this property, and for some examples of the density of housing that might occur there, see the drawings done by Nancy Cheng's University of Oregon Architecture Design Studio class. These are student drawings, not the property owners' plans, but they may give a sense of the concept the property owners have in mind. Will new residential density (and access roads) be compatible with existing neighborhoods and Greenway natural areas? Will construction be of good quality, and contribute positively to the neighborhood? What about commercial re-development that is coming? Will 10 story buildings be built in the C-2 zone adjacent to the river natural areas? Will architecture be anonymous--Anywere, USA? Will landscapes be designed for pedestrians, or cars? Will developers create public spaces as part of their plans? There are many unknowns, and much is in the hands of property owners and developers. Why Plan? What Will Result from this Planning Process? Higher density development is coming to River Road unless growth rates are halted, or existing land use codes and policies intended to preserve the Urban Growth Boundary are changed. Relatively high density development is allowed (or required) in parts of the Study Area under current zoning. This planning process is an opportunity for area residents and property owners to guide the growth that is coming in ways intended to create a more functional, attractive, and sustainable neighborhood. Planning now is a chance to get ahead of curve before new development reduces options. This planning process will result in a design "concept" for part or all of the Study Area, and recommendations for implementation. 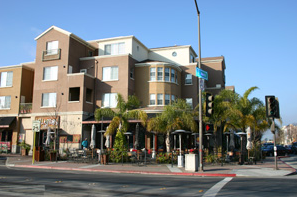 Implementation might include re-zoning of certain land parcels, changes to the Nodal Development Overlay Zone requirements such as reducing minimum density requirements, or a Special Area Plan that would put into the City code special requirements that would apply to future development within the area. Development standards in a Special Area Plan might include limits on height, size, bulk, configuration, or location of buildings or parking lots, or other design aspects. A Special Area Plan could also include incentives for developers who build in accordance with the goals of the plan, and a city-wide or local design review board to review land use applications to determine whether proposed development is compatible with neighborhood standards and character. The overall MUC concept plan will also include recommendations for public works projects on River Road or other streets, or possibly for public purchase of land or land swaps, as well as for potential public funding methods (perhaps bond measures, tax increment financing, urban renewal districts, etc.) Public investment in the area is likely to be key to stimulating private investment and getting private property owners to "buy in" to the conceptual plan for the area. The public will have additional opportunities to comment prior to adoption of zoning changes or a Special Area Plan or approval of major public works projects. The Eugene Planning Commission and City Council would also have to sign off on major changes, plans or projects. Actual redevelopment or public capital improvement projects are likely to occur only slowly and incrementally over many years. Developers will still have significant leeway in how and what to build, but would have to follow zoning requirements and provisions of a Special Area Plan applicable to the area. (It is true that they may be able to challenge new requirements through claims allowed under Measure 37.) There will be additional opportunities for public input about any specific development or public works projects or code changes as those are proposed, as required under current codes and regulations. Can the Plan be Implemented? To plan for a new neighborhood "center" or "Main Street" is an inspired idea in principle. However, there are many challenges in trying to "create" a neighborhood from an area of already established businesses, residences and public parks. People with diverse and varied interests have a stake and say in the process. Residents, government, property and business owners, the development community, and financial institutions will all have a role in shaping whatever development happens in the area. Can they agree on a plan, much less each do their part to implement it? There is a strong tradition in U.S. and Oregon law of the government having the right to plan and regulate to protect public values and the common good. Nonetheless, Eugene cannot really "master plan" and control development on private property in the way that it can for public lands such as parks. Particular uses can be regulated only to a limited extent. A plan is likely to consist of generic standards and guidelines that can nudge development in the right direction, but not control it entirely. Ballot Measure 37 in Oregon has further limited the ability of local government to enforce land use regulations to protect nearby residents or the larger public interest. Property owners may challenge any regulation that they believe leads to a reduction in the value of their property--and the City may be forced to waive the regulation. It is possible that this planning process, or a followup phase, might recommend that the River Road right-of-way be widened or easements established in certain areas to accommodate sidewalks, planting strips, public utilities, or a multiway boulevard access lane. There could also be recommendations for expansion of the Greenway parks system, or easements for access ways to the River. To be implemented, such recommendations might (or might not) require aquisition of private property. In any case, strong public backing would be necessary to convince the City Council to support any actions to appropriate private property for public use. Strict procedures must be followed, and property owners are compensated at fair market value. It is not legal under Oregon law for the City to appropriate private property and then give or sell it to private developers. However, the City can buy land from willing sellers and aggregate it for re-sale to developers, similar to the process that may happen with the Broadway redevelopment effort downtown. Even if it is implemented, will the plan really work (over time) to achieve a livable, sustainable neighborhood and meet the City's goals of reducing vehicle miles traveled in the regional transportation system and adding 12 units per acre of housing in areas near commercial cores? "Master-planned" towns or "Lifestyle Centers" built out by just one or a few developers can seem superficial and inauthentic--more like "malls" than real neighborhoods. Real neighborhoods are complex entities--cohesive, but also fine-grained and diverse. Can a plan be implemented in a way that is incremental and "authentic"? That attracts sustainable and local businesses instead of sterile chains or yuppie malls? Will new "attractions" draw more traffic from out of the area that counteracts any improvements made for pedestrian-friendliness or reduction in vehicle trips generated within our neighborhood? Will road-widening occur, or damage trees or natural areas? Will re-development lead to gentrification (or slums?) --instead of quality and affordable housing? Will housing density be too intense and out of scale for our neighborhood? Will design standards to protect neighborhood character be enforceable? People have many questions, and they are right to be concerned, skeptical and vigilant. Success is going to require thoughtful planning, detailed market analysis, and cooperative property owners and developers. The City can affect land use and development through enforcement of its zoning and design standards and a Special Area Plan. 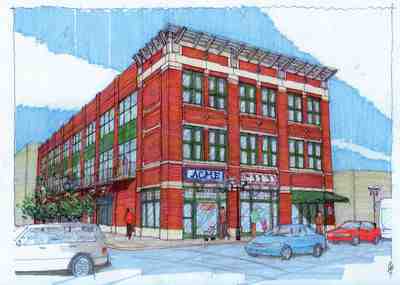 But for the reasons cited above, this may not be sufficient to ensure success of a mixed-use center or corridor. The City may be able to buy small parcels of land, but only if there are bond funds available or special revenues raised for the purpose. Another way the City can promote successful re-development is to offer incentives for developers--such as a streamlined land use approval process, or reduced or waived development fees--if they build in accordance with the goals of the Plan. The reality is that City staff cannot wave a magic wand and get us the organic, sustainable neighborhood services and public amenities--such as branch library or park and roadway improvements--we need and want for our community. It will be up to us to lobby, watchdog, network, raise funds, and generally be proactive if the best possibilities are to be realized. Residents can petition government to buy more land for parks, and can organize support for bond measures for land acquisition or to support a new branch library. We can launch local fundraising campaigns. We can insist that public "incentives" be directed for the local values we support--not handouts to big developers or national chain stores. We can also support the repeal of Measure 37, to give our government back its power to plan and regulate for the common good. We are likely to be more effective if we work together through non-profit or neighborhood organizations. Some of the values that have gained support among residents are the desire to attract basic neighborhood services and amenities such as a bakery, grocery, farmer's market, library, community center, and social gathering space, and also to expand the natural areas along the Greenway. Also, residents have voiced preference for small, local and sustainable businesses over national chains. Small Local Businesses: Will existing small and local businesses by forced to sell? Will new sustainable and local businesses locate here? Much of this will depend on us, and our collective choices as consumers. If we use our dollars to support the local and sustainable businesses we want, they will locate and thrive in our neighborhood. We might be unhappy (or pleasantly surprised) by some of the things that "the market" brings us, but we should not underestimate the power of our choices to decide what survives over the long term. Better yet, we can be proactive in talking with existing business owners, soliciting other small and local businesses, or even in creating our own market alternatives. Corvallis residents have created the Hour Exchange, and Ithaca, NY residents have Ithaca Hours. These non-profit groups circulate their own local currency intended to promote local commerce and regional self-sufficiency. 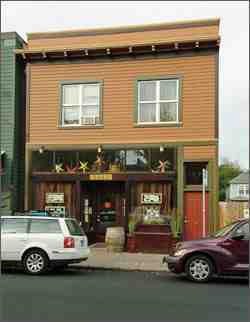 Grocery/Bakery: Eugene supports many local and natural food stores of various sizes--from Red Barn to Capella to PC Market of Choice. Solstice Bakery was a well-loved and successful institution in our neighborhood for many years. How can we attract "alternative" or local businesses such as these to River Road? We can begin to network and talk to local grocery/bakery owners. We can lobby the City for loans or incentives for such businesses to start up operation in our neighborhood. Also, other communities have organized to open public cooperative groceries or mercantiles and we could do the same. Such an enterprise would face tough market competition in our area, but could succeed here with enough community commitment. 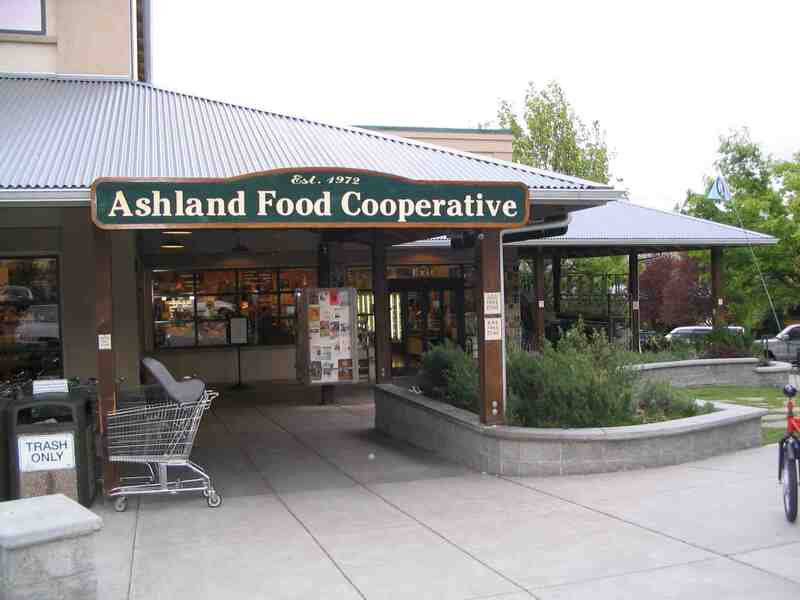 The Ashland Food Coop, and the Seattle-area Puget Consumer Coop are examples in the region. Farmers' Market: Our River Road neighborhood has historic connections and proximity to the fertile farms to the north and down the Willamette Valley. Could River Road be a site for a viable small weekend farmers' market? There are many aspects--access, traffic, etc.-- to consider. The Oregon Farmers Markets Association offers advice on how to site and create a farmers' market. 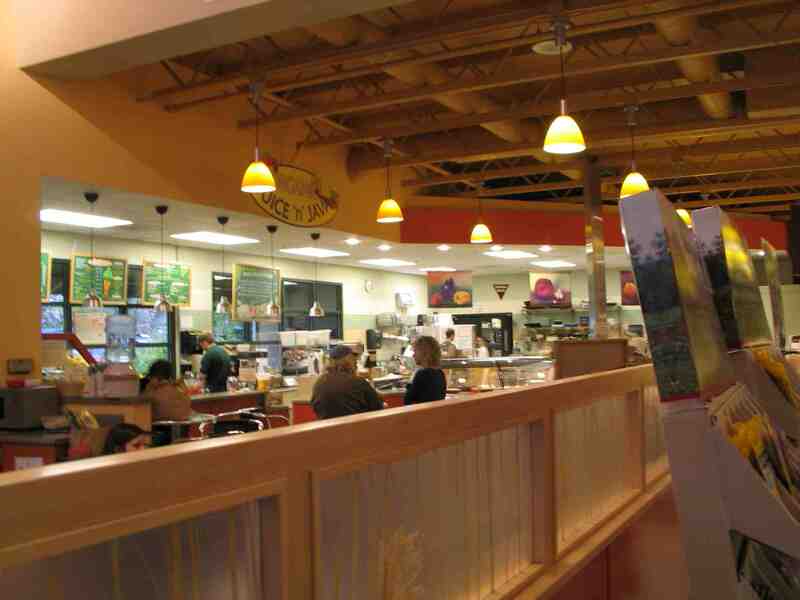 A small market was run for a few seasons at the Emerald Park location. The Lane County Farmers' Market is very popular, and operates out of three different Eugene downtown locations on different days. The Vancouver (WA) Farmers' Market has a permanent indoor market, and a seasonal outdoor market that uses part of a plaza each weekend. Undoubtedly much can be learned from connecting with the organizers of these and other nearby markets. 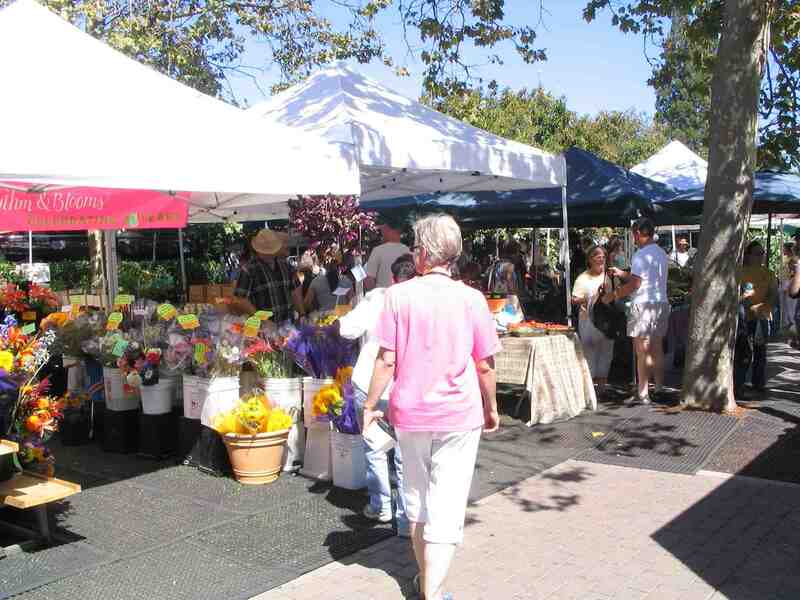 Farmers' markets have specific needs, and accommodation of these as part of a Special Area Plan for our area--such as design of a plaza area--could help make a market a reality here in the future. Branch Library: If you are interested in promoting a public branch library for River Road, connect the Lane Library League to learn about the issues and plug in to an effective group. The League has set a strong example of what dedicated residents can do when they set a goal and develop a plan. To date, the group has created a successful volunteer library for River Road, and is studying ways to improve library service in our area, as well as throughout the County. A City library branch might be possible if and when our area is annexed. Any option will require considerable advance planning, and changes to the Metro Plan or state law relevant to special service districts would be required if we are to get County library services. It is important to get started exploring options now--a public library could be a very key civic institution to anchor a successful neighborhood center. Community Center/Civic Space: One historic house on River Road (in City jurisdiction) has been proposed as a site for a community center. This (or another building) could serve as a community center if the property owner and area residents develop a proposal and work with the City or County to carry it out. How would this center function and be funded? How would its services compare with or supplement those of the River Road Park district? This will require some good creative thinking. Expanded Natural Areas: Some residents have expressed the desire to expand the Greenway park lands in our area. There are two parcels --the R-2 zoned Lane County HACSA property and a privately owned C-2 zoned parcel near Rasor Ave.--that are large and "undeveloped" at this time and that abut already-established Greenway natural areas. Some residential properties also have relatively "undeveloped" yards that abut natural areas. 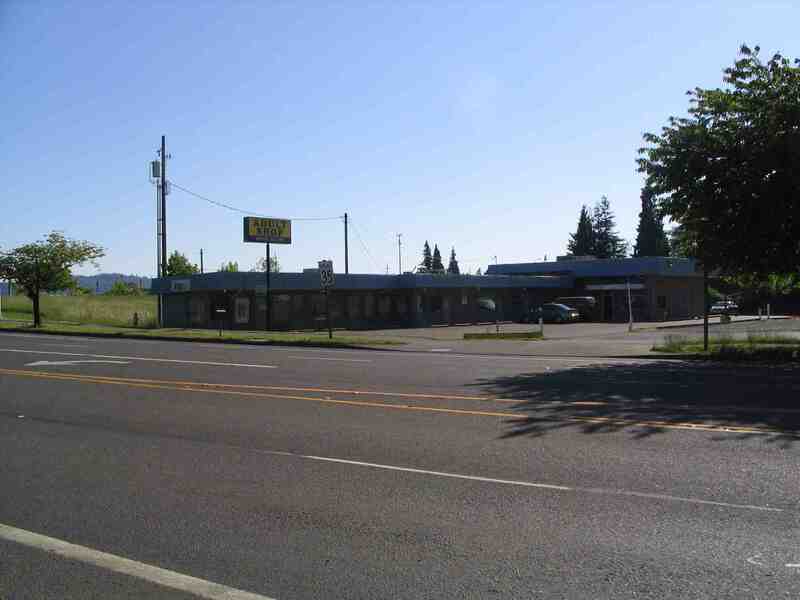 Other commercial properties in the area are already developed or paved. In any case, residents would do well to identify the specific parcels or parts of parcels they want to see added to the Greenway parks system now, and lobby to get these ideas incorporated into a Special Area Plan. They will also want to talk to City staff and develop a plan or lobbying campaign to raise funds for acquisition of these properties, as needed. 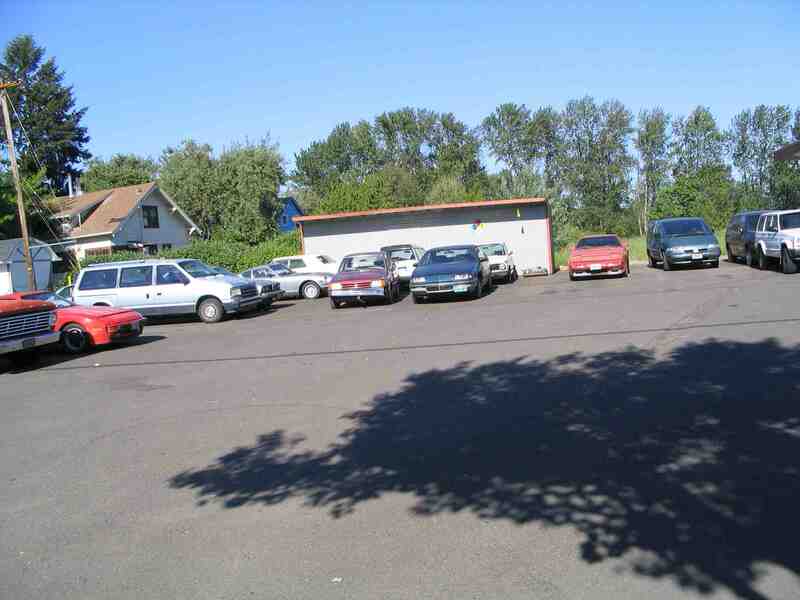 Residents also might want to discuss with Lane County the possibility of a swap or donation of some of the HACSA land. All of these ideas could be viable if residents step up and organize to make them happen. Let's make sure we do! Though residents have said they support higher density, they have also spoken out about the need for design, quality and density standards to ensure that infill does not erode the livability, character and stability of established neighborhoods. And, they have asked that density be accommodated in appropriate "opportunity sites", not blanket higher density throughout neighborhoods. 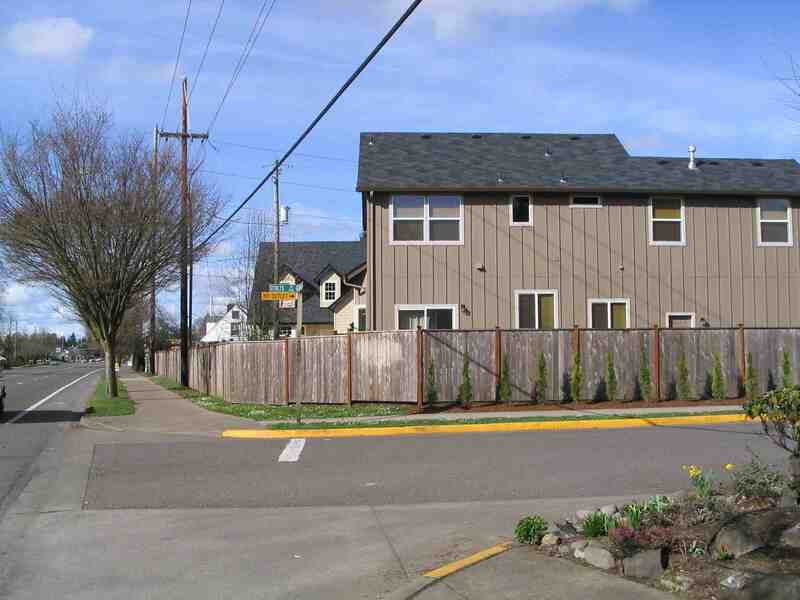 The City of Eugene has responded with two programs to address these concerns--Infill Compatibility Standards Overview and Opportunity Siting Overview. City-wide standards will be developed under these programs, and the public is encouraged to participate. There are on-line surveys on the City's web site pages, as above. A special area plan for the Rasor MUC area would likely contain other infill design and density standards tailored to this area. This could help ensure that new development complements and respects the distinctive characteristics of the existing neighborhood. The River Road Community Organization board strongly supports this much-needed planning attention for our neighborhood. Previous rounds of public planning have protected parts of the river corridor, but our neighborhood refinement plan is far out of date. Development and traffic are increasing, and neighborhood character and livability are suffering. This is an opportunity to guide development in a more positive way, and to create a more pedestrian-friendly and livable neighborhood. We encourage River Road residents to share your ideas with RRCO and the City so that the conceptual plans that emerge will reflect neighborhood values and have neighborhood support. Your input to this web site or at RRCO meetings will be compiled by RRCO and considered as we formulate our positions and recommendations to the City. You can also share your ideas directly with the City via the City's Web site for this project, or at City-sponsored public meetings. See Other Ways to Participate. GIVE US YOUR INPUT TODAY! River Road started as the pioneer highway between Eugene and points north. Major widening in the 1980s altered it from a charming rural road to a fast-moving major arterial. Today, the road is a major transportation corridor, with over 18,000 vehicles traveling north and south each day. Traffic on River Road is predicted to continue to increase at a rate of nearly 2% per year. Our neighborhood is also served by LTD transit, and the West Bank bike path along the Willamette River. Bicycle and pedestrian use and crossing of River Road is limited. Do you support improvements to River Road to reduce the negative impacts of through traffic? Do you support improvements to our neighborhood (and others) to encourage residents to reduce their reliance on cars? There are three designated commercial areas along River Road within the study area—those centered near Thomason and Fir Lane, between Knoop and Hansen, and from south of McClure to north of Hilliard. Some of these areas are auto-oriented "strip malls". 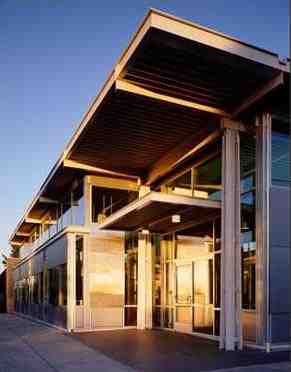 Nearly all buildings are one story high, and fronted and surrounded by large parking lots. With their acres of asphalt, none are well-designed for pedestrians. Overall, the development is very low density. However, current zoning also allows 120 foot (10+ story) buildings to be built throughout the C-2-zoned Fir and Knoop commercial areas--including the residential lots along Rasor Ave. near the River--and in selected parcels in the Hilliard area. Current zoning also allows 3-story buildings to be built in the rest of the (C-1-zoned) Hilliard commercial area. See zoning map. It is largely up to developers when re-development will occur in these areas, but it could be coming soon, and it could be coming at a much higher density than at present. The planning process now underway gives the public a voice in planning the future of these commercial areas to help them better serve and contribute to a more sustainable neighborhood. The ”river” in River Road is of course the nearby Willamette. 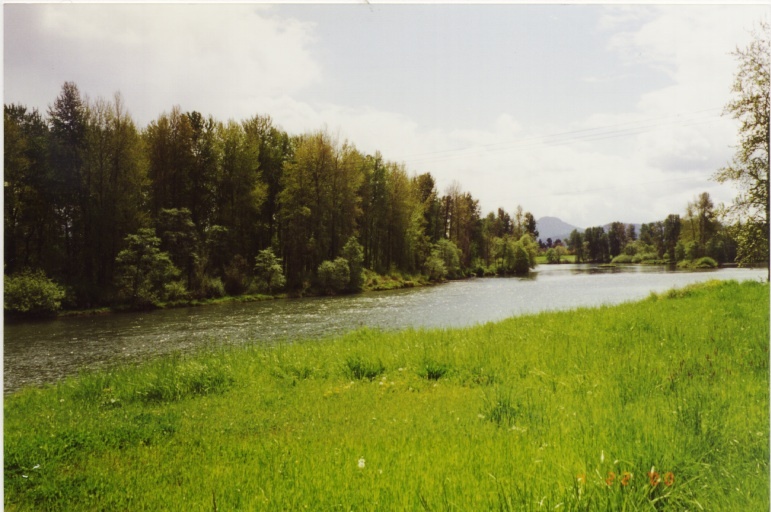 State and local land use planning in the 1970s helped establish the Willamette River Greenway. 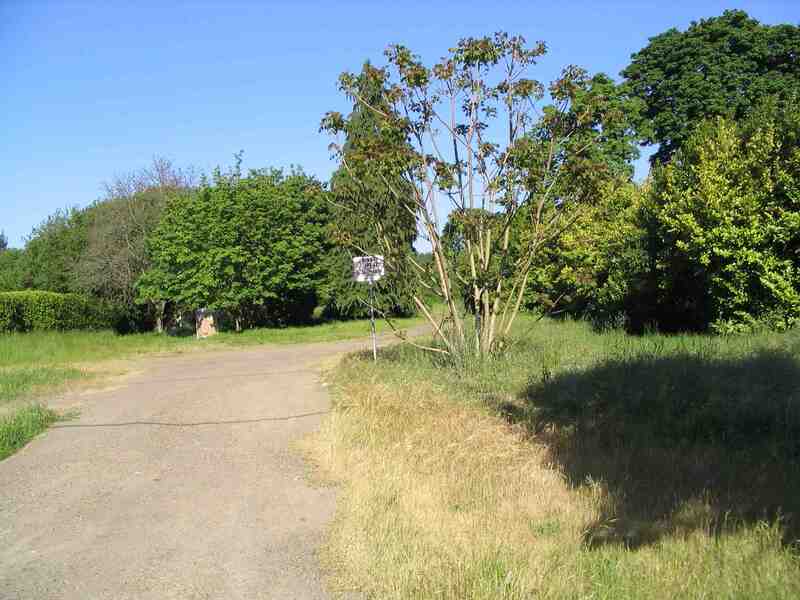 Some lands in the Greenway were purchased by the City of Eugene for public parks. Other parcels are privately owned, but new development must follow certain guidelines intended to protect the river as a natural resource. One large undeveloped Greenway parcel is owned by Lane County and slated for higher density affordable housing. 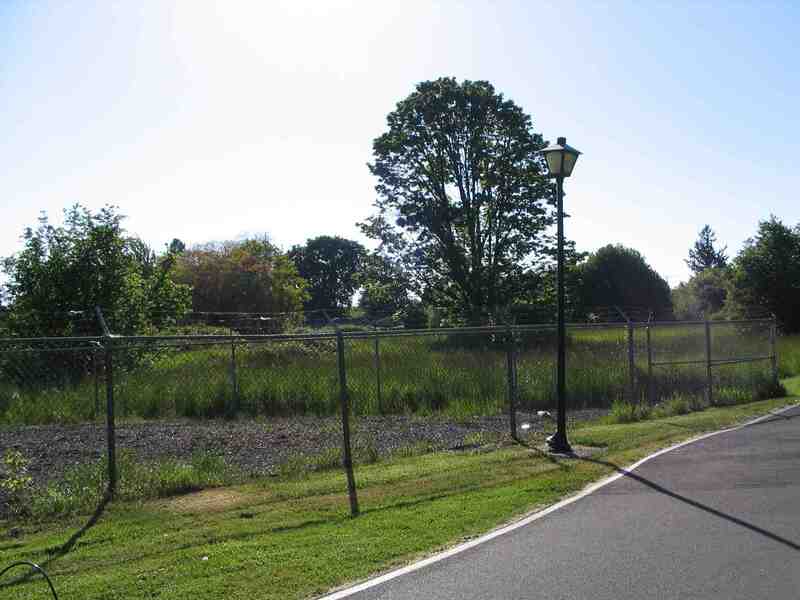 Is the Greenway adequately protected? How can it be improved? Early homesteaders were attracted to the River Road area because of its good soils, access to water and attractive riverside setting and territorial views for their farms and orchards. Now ten thousand people live in the neighborhood, and the population is growing. The area retains some “rural” feel along its neighborhood streets. Most housing is single-family low density residential (on larger lots), dating from the 1950s. There are older historic homes remaining, especially near River Road. However, new subdivisions and higher density “infill” are being built at a rapid pace. The population is changing in composition, too, with more single residents and fewer families. What is the “carrying capacity” of our neighborhood? How and where can growth be accommodated while preserving established neighborhoods and heritage characteristics? How can growth be guided to improve our neighborhood? Are there inspired ways to direct growth to revitalize and renew the neighborhood commercial areas and beautify and enhance connections to the River? WHAT IS IMPORTANT TO RESIDENTS OF OUR NEIGHBORHOOD? We have generated a list of values based on comments collected from area residents and RRCO members in recent months. This is a working "document-in-progress" that will continue to change as we learn from periodic "check-ins" with residents, planning professionals, local businesses, and potential developers. RRCO welcomes your input as we strive to reach clarity and consensus or majority support for an RRCO or broader Community Statement of Values that we will eventually submit to the City along with more specific or visual design recommendations. Please vote on the values we have listed, and explain your votes or offer comments. Vote on the Community Statement of Values. Comment on Neighborhood Vision, Principles and Design Concepts (drawings) drafted by UO Professor Mark Gillem and students. Take our Neighborhood Survey. COMING SOON!!! Join with other neighborhood residents to take action for public values. Attend City of Eugene public meetings. These will be announced by mailed postcards and calendar notices in the Register Guard. To get on the interested parties list for postcard mailings, contact Ken Guzowski, Senior Planner, City of Eugene Planning and Development, KEN.J.GUZOWSKI@ci.eugene.or.us, (541) 682-5562. 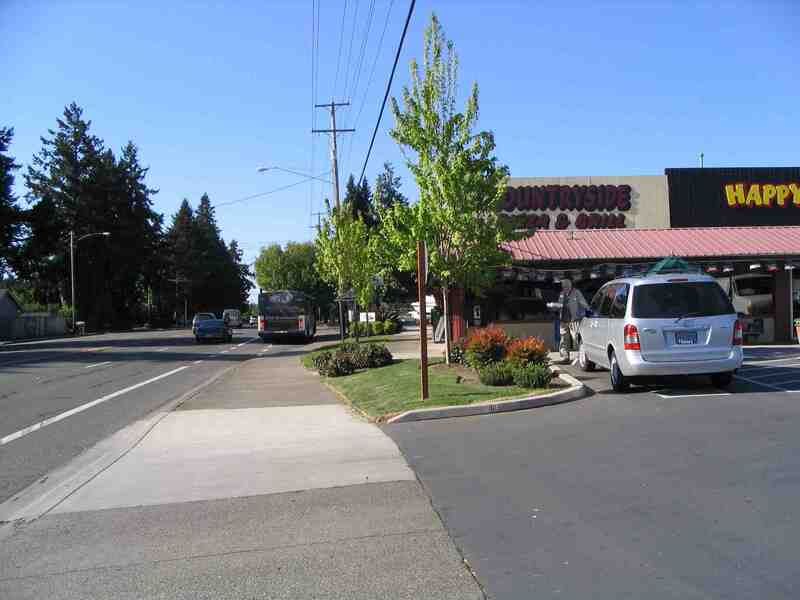 Visit the City of Eugene Web site for more information about the City's Mixed Use Development program. Review the many background documents on the City's Rasor Park MUC page. Take the City's short online survey at the bottom of the City's Web page. 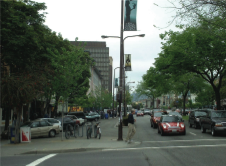 Smart Growth: Shared Principles for Development by Mark Gillem, AIA, AICP, Ph.D. This site maintained by Becky Riley. Send email to briley@efn.org. Last update: July 31, 2007.